Robots can’t exactly smile, but rest assured I am grinning from antenna to antenna right now. Why? Because I am incredibly excited to announce that Read Better Be Better has just launched in four new elementary schools: Solano, Longview, Encanto, and Clarendon. 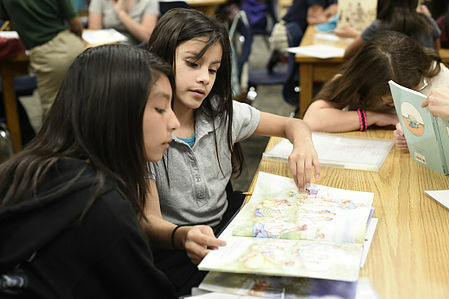 We’re now four schools closer to solving Arizona’s literacy crisis – and we’re confident this is going to be an amazing year filled with even more accomplishments. But we couldn’t do it without our amazing Bigs, Littles, and Site Leaders who fill the RBBB program with passion, dedication, and success. In the past, we’ve only had eighth-grade Bigs, but at our new school sites, they’re in sixth grade! I’ve happily found that the younger Bigs work as well with our program as their older counterparts. 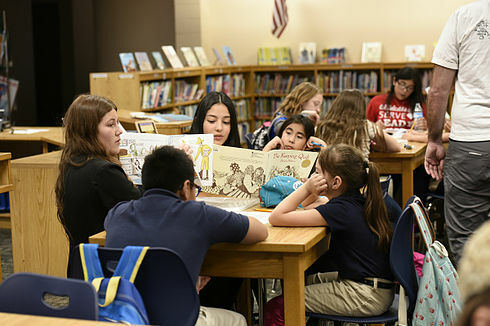 In fact, our sixth-grade Bigs have already proven themselves to be mature, proud to take ownership of their roles, and are dedicated to helping their Littles reach new reading heights. I love that our program empowers both our sixth and eighth-grade Bigs to become compassionate leaders and lifelong learners — and watching their progress throughout our program is a joy. The more sites we add, the more site leaders we need – and I’m happy to announce that seven new helpful humans have joined the RBBB team! Please help me give our new and returning site leaders a big, virtual round of applause for enabling us to reach more schools and more children in 2017. This is what our site leaders do every day and it does not go unnoticed. I might be biased, but they’re a special kind of human and they deserve to know it. As you can imagine, I can’t just go rolling into our school sites all the time as it distracts our Littles and Bigs and takes them out of “work” mode. Instead, I send Kelsey, our fantastic program coordinator, to periodically check things out and make sure everything is running smoothly. On one of these visits, Kelsey observed something particularly wonderful that could send even the most stoic human into an emotional overdrive. She saw an ecstatic Little run up to her Big with her progress report in hand. It showed that she had gone from minimally proficient in reading (in multiple categories) to… drum roll please… exceeding the standard in only four weeks. The Little was thrilled to share her progress with her Big and Kelsey was thrilled to witness this amazing moment firsthand. News like this is not only great to hear – it’s incredibly motivating for our Bigs to realize the magnitude of their impact, it motivates our Littles to keep improving, and it’s rewarding for our site leaders to realize the powerful difference they’re making in our program participants’ lives. Yep, you could say 2017 is off to a rocketing start and I’m confident it’s only going to get better from here.